A few weeks ago, Google launched SearchWiki to the public, making all Google searchers who are logged in, advanced searchers. I was surprised by this, so I asked you guys, do you think the average searcher is ready for this. After 150 responses, the results are in. 124 (or 82.67%) of you said, no, the average searcher is not ready for the Google SearchWiki. 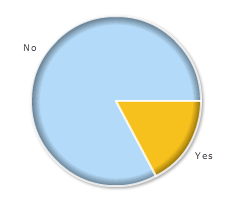 While only 26 (or 17.33%) of you said, yes, the average searcher is ready for the Google SearchWiki. Maybe my post skewed the results, but honestly, are we ready for this? Forum discussion continued at Cre8asite Forums, WebmasterWorld, Sphinn and DigitalPoint Forums. Previous story: Google's SearchMash Is Now A "Dinosaur"